Not valid with any other offer. You will be able to instantly download your voucher in PDF format that can be printed to redeem. Customer must present printed voucher at Wichita Theatre ticket booth before the show. Limited Quantity Available at this special price! 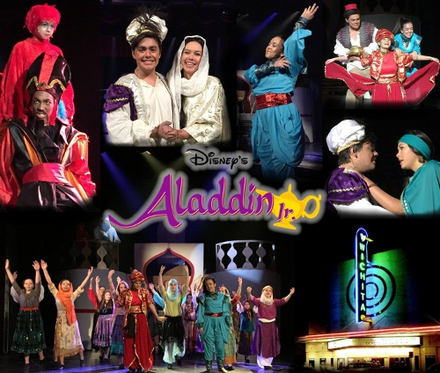 Don’t miss this spectacular live-on-stage production of Disney‘s musical, Aladdin Jr.! Filled with magic, mayhem, and flying carpet rides, Aladdin vies for the love of a beautiful princess with the help of his genie’s magic. A performance that will leave you singing songs like “a Whole New World” and “Friend Like Me”. Let this musical take you and your family back to Arabian Nights. The Wichita Theatre & opera house is a designated Texas Historic Landmark, built in 1908. Once a Vaudeville House then movie theatre, the Wichita Theatre now a non-profit organization offers a wide variety of family entertainment. The 2015 seasons consist of “Mary Poppins”, “Annie”, “My Fair Lady”, and “Into The Woods” all directed and preformed by the community of Wichita Falls.